Here in Palm Springs where the climate is warmer, I have become familiar with several related species, all members of this family which shares the notoriety of being highly poisonous. Bearing some similarity to Vinca, there are the Madagascar periwinkles, cultivars of Catharanthus roseus. This tender perennial likes warm conditions, so may be offered as a pot plant in the UK but struggles if planted out for bedding as its just too cool. By contrast here it is one of a handful of summer bedding plants that thrive in the searing summer heat. I have grown a few in pots for several years and found that they grow and flower continuously for months and even self seed. The following picture shows a pot planted a few weeks ago and nearby a self seeded plant from last year, surviving on the run-off from the pot's irrigation. Just this year I have seen for the first time a new range called 'Soiree' that have semi-double flowers. I'll tell you later in the season how they perform! Last year I was given some cuttings of Plumeria, sometimes called frangipani. These grew and grew, producing a mass of dark green leathery foliage and drinking rather too much water in our time of drought. Finally this year three of them have flowered. The blooms are beautiful and sweetly scented but I'm really not sure if they are worth all the space and time for just a few delicate flowers. In the right location, they will make huge bushes covered in flowers, so I guess I'll keep some. 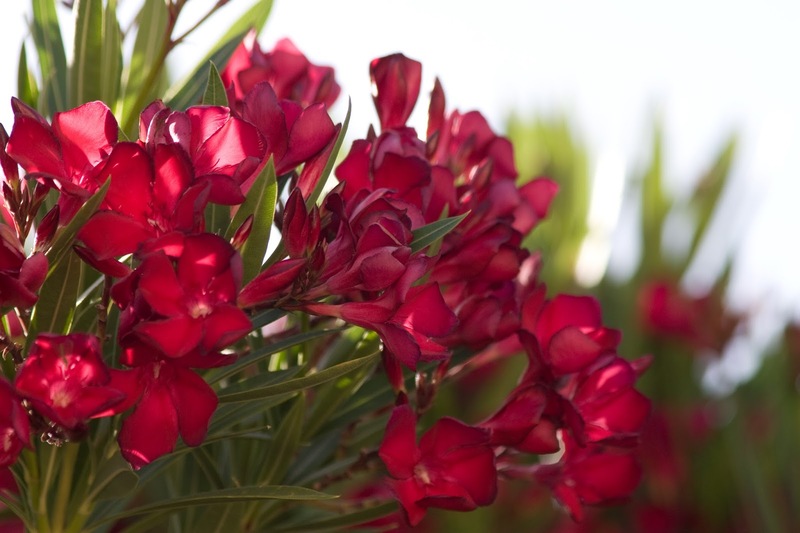 Out here oleanders are common landscape shrubs, planted everywhere, tough, evergreen and floriferous. Sadly they suffer from a scorch disease which causes them to die. Its endemic here in California, with no cure and you can see patches of die-back in hedges everywhere. In my little garden I have risked planting both a red and a white. Struggling with the wind here, I needed to plant something tough in a couple of tricky spots and providing the disease doesn't reach here, they will withstand the buffeting! Remember however that it's highly poisonous - don't be tempted to cut the straight stems for barbecue skewers! Another noxious relative is the Madagascar palm, Pachypodium lamerei. Ignore the common name - it has no relationship to palms! It is however, a real desert plant with prickly succulent stems which grows slowly but eventually makes a tall stately plant. When mature, it produces white flowers, very similar to plumeria and oleander. Finally I must mention the Mandevillas which are straggly climbers with glossy leaves and pretty starry trumpet flowers in reds and pinks. 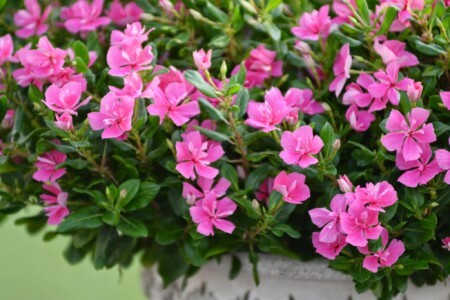 Despite their habit of growth, they are sometimes offered as small pot plants covered in flowers. Again - same family - pretty but poisonous!